Q - How do the Caribbean’s distinctive features make it vulnerable to climate change? A – With 30 diverse countries and territories and more than 40 million people, the Caribbean comprises most of the world’s small island developing states (SIDS), places of extraordinary beauty and vulnerability to natural and human-made shocks, none more so than climate change. With more than 50 million arrivals per year, by air and cruise, it is the most tourism-dependent region in the world. But the industry is vulnerable to damage by climate change. The Caribbean oceanic basin is trapping warming and increasingly acidic waters, with unprecedented coral reef bleaching and die-offs and impacts on food and economic security. It is experiencing increasingly intense and frequent extreme weather events. Floods from heavy rainfall combined with rising sea levels create immediate emergency health relief needs, damage health centres and hospitals, and increase the risk of epidemics. Climate-sensitive disease vectors such as Aedes aegypti mosquitoes carry dengue and Zika. As temperatures rise, they are increasing in density and their ability to spread disease. Zika shows the intergenerational and cross-border costs this can bring: there is now local transmission of the virus in southern Florida. The Caribbean’s largely middle-income countries are ineligible for many of the development and climate change control funding available only to low-income countries. Yet their capacity to respond is low because of their very small size. Q - How have these vulnerabilities inspired the Caribbean to pioneer solutions? A – The Caribbean Community Climate Change Centre (CCCCC) was established in 2005. The Pan American Health Organization’s ‘SMART Hospitals’ programme to build resilience to the effects of climate change is a good contribution. 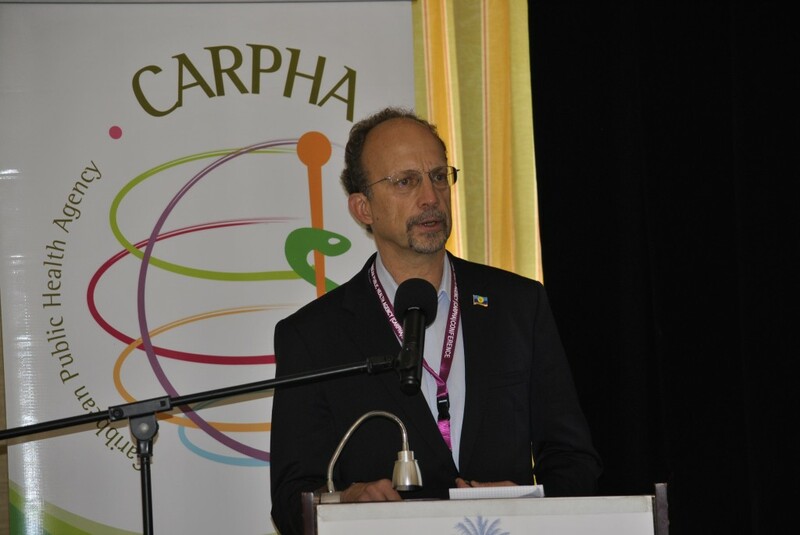 The Caribbean Public Health Agency (CARPHA) recently launched the Expert Panel on Climate and Health with Tulane University to analyse, control and prevent the impact on human health and the environment. The Caribbean Catastrophe Risk Insurance Facility (CCRIF) was created in 2007 to help countries manage the economic risks of increasingly frequent hurricanes. Its work was endorsed by the G7 leaders at their summit in 2015. Discussions are under way to expand the coverage to include associated health effects of extreme weather events. Greening the CARPHA campus is another initiative to reduce greenhouse gas emissions and reduce energy costs. Q - What more could the Caribbean do? A The Caribbean Hotel & Tourism Association could work with regional institutions to rank how tourism facilities perform on integrated environmental and health standards. Cities of the Caribbean could be encouraged to join the C40 and ask it to address health effects and economic impacts in a broader and more integrated way. The Expert Panel calls for promoting alternative transport such as biking and walking, with links to the tourism industry, with triple bottom line returns. The Caribbean could create an integrated annual state-of-the environment-and-health report. This need for a joined-up set of information is a key recommendation of the Caribbean Development Bank on water as a strategic regional resource. Caribbean institutions could work more closely with the International Seabed Authority and UN Environment’s Caribbean Office – both headquartered in Kingston, Jamaica – to increase bidirectional learning about the health effects of climate change. Q - How can the G7 leaders at their Taormina Summit best help? A – G7 leaders could recognise the unique shared interests of the G7 and the G20 in the Caribbean – given the region’s location between North and South America, closely connecting independent countries with territories dependent on the United States, United Kingdom and the Netherlands, and parts of France through travel and trade. They could work with the region’s institutions to implement a G7/G20- CARICOM project to address health, climate and the environment in pursuit of the Sustainable Development Goals. They could recognise the Caribbean’s contributions beyond the CCRIF, and create a global risk insurance facility based on a more comprehensive and integrated concept of climate-associated risks that incorporate their many health effects. They could invite Caribbean leaders to attend the next G7 summit, in Canada in 2018, as was done for Jamaica and Haiti when Canada last hosted in 2010. They could institutionalise a regular dialogue between the G7 and Caribbean institutions responsible for health and climate change, starting with regular preand post-summit briefings. They could create an emergency response and surge capacity fund that can be drawn on by regional institutions such as CARPHA to address the health effects of climate change. Peruse the complete G7 publication here.